Genetic Testing Market size was valued at USD 10.6 billion in 2017 and is expected to witness more than 11.6% CAGR from 2018 to 2024. Increasing demand from patients for personalized medicines will fuel the demand for genetic testing during the forthcoming years. Personalized medicine offers tailored medical treatment to patients based on their molecular basis. Various developed economies such as Europe undergo genetic testing for detection of various genetic and rare diseases. Detection of diseases at an early stage facilitates early treatment and helps reduce severity of diseases. Growing adoption of personalized medicines coupled with increasing awareness regarding early diagnosis of disease will boost the industry growth over the forecast period. Technological advancement in genetic testing is expected to drive the genetic testing market during the coming years. The demand for genetic testing is increasing across the globe owing to the availability of new tests as well as advancement in the genetic testing techniques. Innovations in tests that offer safer and efficient techniques of disease detection, surpassing the risk of miscarriage during early stages of pregnancy will serve to be a high impact rendering factor that will drive the genetic testing market growth during the forthcoming years. Dearth of experienced professionals and advanced infrastructure in developing as well as under developed economies is should hamper the market growth over the forecast period. Accessibility to quality healthcare in low resource areas is difficult to maintain owing to lack of infrastructure. Moreover, risk of false interpretations associated with unavailability of experienced professionals will restrain industry growth noticeably. Diagnostic testing segment accounted for the highest market share with a revenue share of USD 5690.6 million and is expected to grow at a significant rate over the forecast timeframe owing to its wide applications in various diseases. Detection of diseases at early stage allow patients to undergo therapeutic treatment at an early stage and minimizes the severity of diseases leading to reduced mortality rate. Increasing prevalence of chronic diseases worldwide will augment the segment growth over the forecast period. Prenatal and newborn testing segment is estimated to witness lucrative growth with a CAGR of 11.6% during the forecast period. Increasing prevalence of chromosomal abnormalities and genetic disorders in the newborns worldwide is one of the leading cause of infant morbidity and mortality. According to Centers for Disease Control and Prevention (CDC), around 3% of all babies born in the U.S. are affected by birth defects leading to infant death. Aforementioned factors will fuel the demand for prenatal and new-born genetic testing during the coming years. Cardiovascular disease diagnosis segment of genetic testing market will grow at the fastest CAGR of nearly12.8% owing to rising prevalence of cardiac diseases across the globe. Genetic testing allows testing for a wide range of cardiovascular diseases (CVDs) encompassing congenital heart malformations. Timely diagnosis of heart disorders helps save lives and reduce the number of CVD deaths. Healthcare system’s efforts towards reducing CVD incidences should fuel business growth over the forecast period. Cancer diagnosis segment dominated the genetic testing market with a revenue of USD 5562.8 million in 2017. According to, The Institute for Health Metrics and Evaluation (IHME), around 8.9 million cancer deaths were recorded in 2016, of which around 5%-10% were caused by inheriting genetic mutation. Rising prevalence of various types of cancer such as prostate cancer, breast cancer and lung cancer coupled with increasing awareness pertaining to early detection of cancer will stimulate the market growth throughout the forecast period. 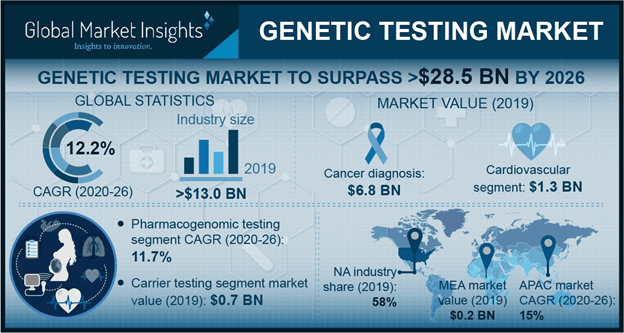 North America dominated the genetic testing market with a revenue of USD 6382.1 million in 2017 and is projected to grow at a significant rate over the forecast period. This is attributable to increasing incidences genetic diseases such as cancer, Turner syndrome, neurofibromatosis, and spinal muscular atrophy. Availability of new tests owing to technological advancements will fuel the demand for genetic testing. Advanced infrastructure coupled with high healthcare expenditure and regulatory support for direct-to-consumer genetic testing will further augment the market growth in the coming years. 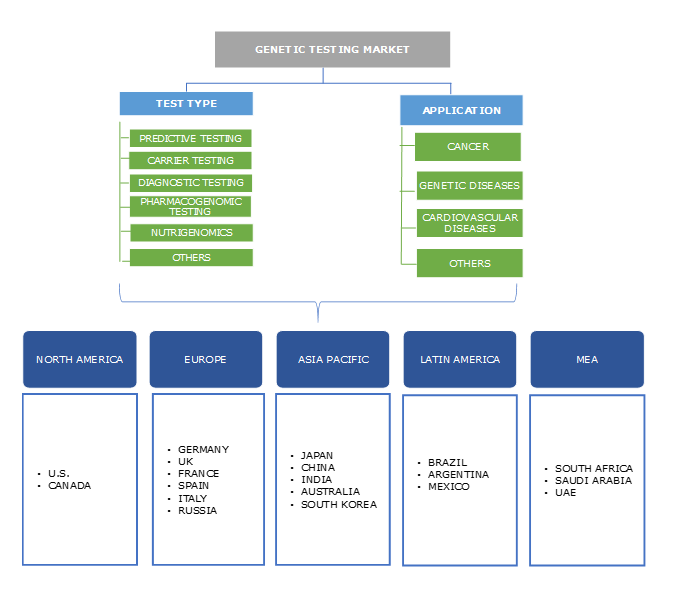 Latin America Genetic Testing Market is projected to grow at a robust CAGR of around 13.3% during the forecast period owing to increasing prevalence of various types of cancer such as prostate cancer, breast cancer and lung cancer. Breast cancer is the most common cancer among women in Latin America. According to the Pan American Health Organization (PAHO), around 4,08,200 women were diagnosed with breast cancer and the number is estimated to grow by 46% by 2030. Hence, adoption of genetic testing for early detection and prevention of cancer and other genetic diseases will accelerate the regional growth over the forecast period. Some of the eminent industry players operating in global genetic testing market are 23andMe, Abbott Molecular, Bayer Diagnostics, Biocartis, BioHelix, BioMerieux, BGI, Celera Genomics, Cepheid, Counsyl, deCODEme, Genentech, Genomictree, Genomic Health, HTG Molecular Diagnostics, IntegraGen, LabCorp Diagnostics, Luminex, MolecularMD, Myriad, Natera, PacBio, Pathway Genomics, Qiagen, Roche Diagnostics, Sequenom and Siemens. Industry players are focusing on strategic expansion through acquisitions, mergers and collaborations help the players to strengthen and enhance the product portfolio. For instance, in December 2017, Roche acquired Ariosa Diagnostics, a molecular diagnostic testing services provider, to enter the non-invasive prenatal test (NIPT) and cell-free DNA testing services market. Rising prevalence of diseases such as cancer, cystic fibrosis, Alzheimer’s and other genetic diseases will drive global genetic testing industry. Increasing adoption of genetic testing for early detection of diseases and identification of genetic mutation prior to its manifestation will further augment industry growth over the forecast period. The industry is expected to witness rapid growth in the future owing to rising physician adoption of genetic testing into clinical care. Availability of regulatory support for direct to consumer (DTC) testing and ongoing advancements in technology enable industry players to maintain their market position.